Educational Choices, Transitions and Aspirations in Europe analyses educational choices and transitions in eight different European countries/regions and provides an engaging means of considering issues of inequality through international comparisons. The book is underpinned by explorations of theoretical perspectives and methodological approaches, which share the common goal of highlighting and challenging educational inequalities in relation to political imaginings and discursive constructions of notions of aspirations and choice. Beginning with an overview of the theoretical landscape, the book posits ways of understanding transitional experiences through both a social and a political lens. 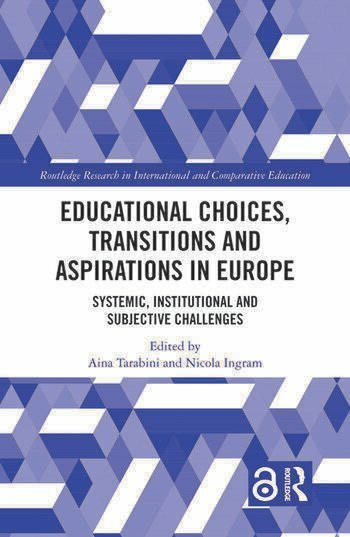 Comprising of chapters that explore these issues within the context of specific countries and at different stages of young people’s transitions, the collection examines the features of different European education systems and how they frame transitions and choices, before providing an overall analysis of systemic, institutional and subjective constraints on these processes. The book uniquely opens and develops an intellectual conversation about different education systems with similar educational challenges and outcomes. Assimilating key issues and solutions, this volume also makes general recommendations for policy and practice that would help to promote greater equity and social justice. The book covers a range of transition points and countries, which should make it essential reading for academics, researchers and postgraduate students with an interest in international perspectives on education. It will be particularly useful for those working in education, sociology, social policy, geography, and politics. 2. Working class educational failure: theoretical perspectives, discursive concerns, and methodological approaches. Diane Reay (University of Cambridge). 3. Student aspiration and transition as capabilities for navigating education systems. Trevor Gale and Stephen Parker (Glasgow University). 4. Transition from primary to secondary education in a rigidly tracked system: the case of Flanders. Simon Boone, Marie Seghers and Mieke Van Houtte (University of Ghent). 5. Working-class boys and educational success in a socially divisive secondary education system: lessons from Belfast (Northern Ireland). Nicola Ingram (University of Lancaster). 6. Framing youth educational choices at the end of compulsory schooling: the Catalan case. Aina Tarabini, Marta Curran, Alba Castejón, Alejandro Montes (Autonomous University of Barcelona). 7. Choosing the right track. Educational decisions and inequalities within the Italian educational system. Marco Romito (University of Milan). 9. National framing and local reframing of students’ transition to higher education in France: limitations and pitfalls. Agnès van Zanten, Alice Olivier, Anne-Claudine Oller, Katrina Ulhy (Science Po, Paris). 11. Higher education students as consumers? Evidence from England. Rachel Brooks and Jessica Abrahams (University of Surrey). Aina Tarabini is associate professor at Autonomous University of Barcelona and researcher at the research center on Globalisation, Education and Social Policies (GEPS). Nicola Ingram is senior lecturer in Education and Social Justice in the Department for Educational Research at Lancaster University and Co-convenor of the British Sociological Association’s Bourdieu and Education study groups.